The Dividist Papers: California Dreaming. I wish I had an enchanted bullhorn that would magically speak directly to anyone or any group. Right now I have a few things to say to the voters of California Congressional District 50. Absent that enchanted bullhorn, I will have to be satisfied with this blog. Republican Brian Bilbray and Democrat Francine Busby are in a statistical dead heat for the California seat vacated by disgraced Republican Randy "Duke" Cunningham. The election is Tuesday. Conventional wisdom is that Bilbray will eke out a narrow victory in this "safe" Republican district. District 50 is a microcosm of the themes discussed in this blog. 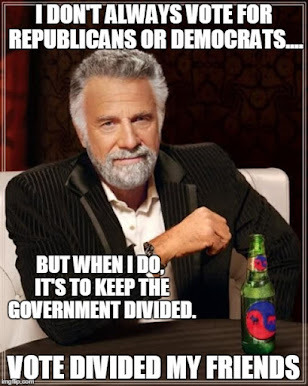 There is an evenly divided partisan electorate, which means that a small swing vote like a "Divided Government constituency" (just to think of an example off the top of my head) could swing the election. 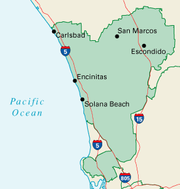 In CD-50 you also have vocal disgruntled conservatives that are unhappy with the Republican party in general and Republican candidate Bilbray specifically, and you also have third party conservative and Libertarian participation that could affect the outcome. All are topics of posts in this blog. The only thing missing is recognition by CD-50 fiscal conservative and libertarian voters that many of their objectives can be met by simply voting for divided government. Obviously nervous about the outcome of the race, the RNC has more than 100 volunteers from outside states on the ground to assist in turning out the voter base..."
Baldwin, who served in the state legislature from 1994-2000, cited in his letter reports from Channel 10 (San Diego) of allegations of perjury and voter fraud against Bilbray..."
"Should Conservatives Support Brian Bilbray?" "Conservatives across the Golden States and those in Washington are anxiously awaiting the results of Tuesday's election - some hoping for victory to retain the GOP seat and others anxious to send establishment Republicans a wake-up call." But while Bluey asks the right question, he does not quite get around to giving the right answer. Logan Jenkins, a columnist for the San Diego Union-Tribune, gets close to the right answer as he makes the case that third party cross-currents could determine Tuesday's results. "Unlike more respectable analysts, my sights are no longer trained on Brian Bilbray and Francine Busby, the major party candidates duking it out with TV ads that they sometimes do, but mostly don't, approve. My own unscientific OK, mystical polling tells me the head-to-head race between these two is virtually over... No, this upcoming election could turn on the surly margins, the twilight zone of scattered protest votes and no votes. Out on the extreme far right of the political spectrum, the main draw should be William Griffith, the independent "republican" (note lower case) whose rock-ribbed conservatism has earned him the recent endorsements of the local Minutemen and the super-conservative American Independent Party, which has about 7,000 registered voters in the 50th Congressional District... Like Libertarian Paul King, the fourth name on the runoff ballot, Griffith has less than zero chance of winning a ride to Washington. Still, Griffith could be the Ralph Nader or Ross Perot of this race. He could draw Bilbray blood in the zero-sum game of the runoff." With an election this close, King and Griffith could make a difference by siphoning votes from Bilbray. 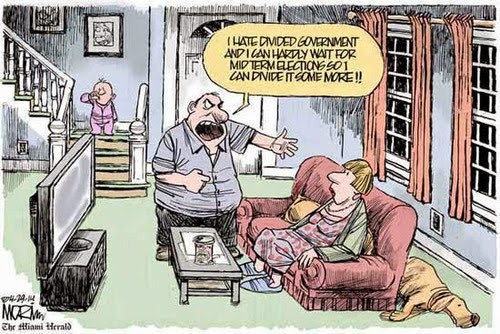 Enlightened fiscal conservatives could make a difference by swallowing hard, putting limited government principles over party politics and voting for Divided Government. The most interesting possibility - Libertarian Paul King could potentially determine the election all by himself by asking his supporters to vote for Francine Busby. In 2004, the Libertartian candidate for House Representative drew about 1.2% of the vote. In this election, that could be enough. Use the spotlight to promote libertarian principles of limited government. Raises awareness of how single party Republican control has unleashed a hell-bound train of advancing state powers and big government spending in the last five years. Do the right thing for the country. Since the Case for Divided Government was made by William Niskanen of the Cato Institute (a Libertarian think-tank), he would be standing on a rock-solid intellectual foundation. It would be beautiful move, a brilliant move, and it just might make a difference. A difference in District 50, a difference in the Republican Party, a difference in the Libertarian Party, and, most importantly, a difference in the country. With 96% of the precincts reporting, Bilbray has 49.48%, Busby 45.28%, Griffith 3.7% and King 1.5%. The third party candidates had no impact, except to depress Bilbray's margin of victory. See you at the same time, same station, with the same players, and the same result, next November. Of course, as long as we as a country keep voting for single party control of the Federal Government, we can also expect the same big government spending and growth, the same pork-barrel feeding at the public trough, the same incompetent cronyism in important agencies, and the same arrogance and bad decision-making in foreign policy. But perhaps I am wrong. Perhaps things will be diifferent now. An unpassable Constitutional amendment to stop two fifty year old lesbians from getting married in San Francisco. Single Party Government = Bad Governance.